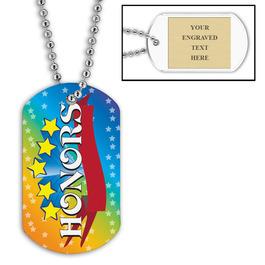 Award your outstanding students with this vibrant, personalized, Honors Themed Dog Tag. Dog tags are a favorite with students and a great way to recognize academic achievement. This Hodges exclusive design is sure to get noticed! Personalize with an attached engraved gold brushed plate. Unattached 30" ball chain included. NO MINIMUMS!